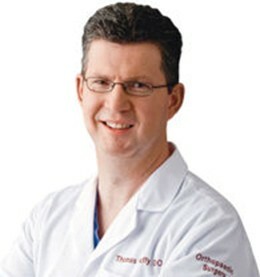 Thomas Duffy, DO, is an orthopedic surgeon and affiliated with Mercy Fitzgerald Hospital. Dr. Duffy loves sports and wanted to be a doctor starting in third grade. He has now been practicing medicine for more than 20 years. He completed his residency at UMDNJ-School of Osteopathic Medicine and his fellowship at Pennsylvania Hospital, Sports Medicine. Additionally, his internship and DO was completed at UMDNJ-School of Osteopathic Medicine. He is certified by the American Board of Orthopaedic Surgery. When surgery is necessary, “I feel it’s important to show my patients as soon as possible that their new knee moves well and that there’s nothing to fear about recovery,” says Dr. Duffy. By night, Dr. Duffy works as the Camden Riversharks’ team physician. He attends most of the games, and if a player is injured, he determines if he can continue playing or if he needs further examination, whether that’s an X-ray or MRI. When physical therapy is required, Dr. Duffy works with the team trainer and performs the surgery if necessary. Doctor Duffy says this experience has helped him to diagnose a wide variety of conditions and understand how a serious athlete versus the weekend warrior responds to different treatments. In the summer of 2009, at the age of two, Grace contracted Lyme disease, which was treated with antibiotics and thought to have cleared up. During the fall of that year, she started having leg pains at night, stiff joints and trouble walking in the morning. At first, her parents assumed her issues were just growing pains. On her 3 year well visit in 2010, her doctor recommended to have her checked by a rheumatologist and on May 18, 2010 Gracie was diagnosed at AI Dupont Hospital with polyarticular juvenile idiopathic arthritis (JIA). She had over 20 joints that were affected. Her parents were floored that they hadn’t noticed this, but Grace had found ways to compensate, dealing with the pain to keep up with her twin sister Natalie. Grace began her medical journey with monthly blood work, drinking “icky” medicine, and physical and occupational therapy for 4 hours a week. When the liquid medications no longer worked, she graduated to weekly home injections, once a week at first, then two. Once again, those medicines stopped being effective and she started IV infusions at DuPont once a month and now goes every 3 weeks. Over the summer of 2013, three yeas after her twin sister Grace’s diagnosis, Natalie became withdrawn and very tired. She started complaining of leg pain. Since she was ANA positive, she was tested numerous time for JIA, but because the results were always negative, it was assumed to be just growing pains. But to air on the side of caution and because, thankfully, her family already had a great team in place with Dr. Anne Marie Brescia and the wonderful Dupont staff, Natalie went through labs, x-rays and an MRI. In October of 2013, JIA was found in both wrists. 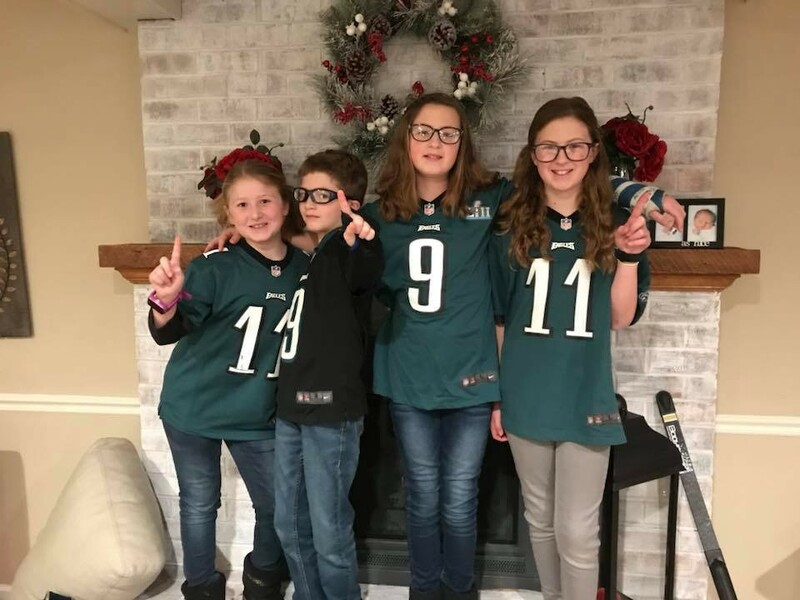 Though her parents had learned a lot through dealing with Grace’s medication regiment, Natalie’s disease has spread quickly into her hips, knees and ankles. Natalie is now on the same medicine regimen as Grace: receiving IV infusions every 3 weeks. She also attends PT at least twice a year for her ankles and hips. Immediately after finding out about Natalie, Henry and Erin were tested for JIA. While they are both ANA positive, they do not have the HBL 27 gene. Erin started having symptoms over Christmas of 2014 and after the normal round or labs, X-ray’s and MRI’s, she was diagnosed in April 2015. Her issues began with pain in her ankles. To compensate, she began roll her ankles in. Despite Physical Therapy and steroid injections into the ankle joints, the JIA was too advanced, which resulted in leg braces the summer of 2016 to help keep her ankles straight. She is now on the same medication routine as her older sisters. Henry took a while to be diagnosed, as it is very uncommon for JIA to run in siblings and he, like Erin, does not carry the HBL 27 gene. Henry began to complain of issues with his knees in 2014 and was diagnosed with a meniscus discord of his right knee. A few months later he began to have issues with his fingers and wrists and was found to have hypermobility in his fingers. Henry started PT and OT two times a week for several months with no benefits. Finally, his parents had to admit what was right in front of us and he went through the same battery of tests his sister had and was diagnosed with JIA in August 2015. Henry has been very fortunate; while he continues to receive occupational therapy weekly, the at home injections and medications are currently still working for him. The Urbanski children are very active and do not limit or define themselves by their illness, rather they excel in spite of it. The family has been participating in the Jingle Bell Run since 2011.